This little thing was too irresistibly cute not to post. 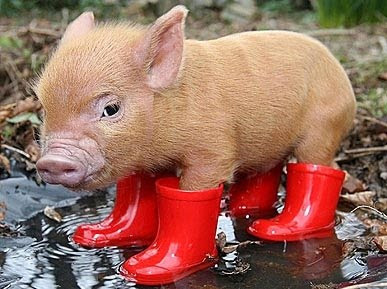 I found little Mr. Clive-the miniature piglet on one of my favorite blogs, Best Week Ever (yes, they have a blog now). Mr. Cutie-Pants was featured on The Graham Norton Show on [insert British accent here] BBC America. Clive's owners threw on some stylish wellies (that they took off a Paddington Bear doll) so the little guy wouldn't be all muddy. Ha! Not gonna lie, getting emotionally attached to this very proper little piglet doesn't make me want to eat bacon any less. Is that totally sick!? Anyway, thanks to Clive's owners, who are sick enough to dress up their future breakfast into an adorably stylish little piglet outfit.